Synopsis: Boy–bashful and not overly brave–defends girl from obnoxious drunk on a Tokyo train. Girl sends boy a thank-you pair of pricey Hermés teacups. Boy’s a geek and doesn’t know what to do next. End of story for most nerds–but this one turns to the world’s largest online message board and asks for help, so for him it’s just the beginning. This matchless love story is told through a series of Internet chat room threads. 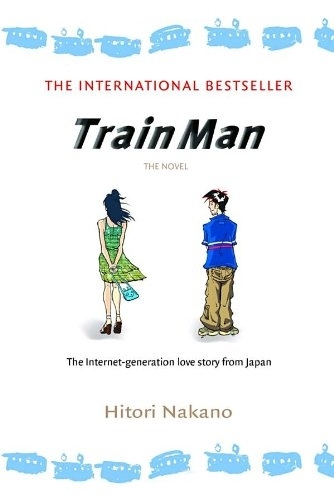 As Train Man, our hero charts his progress and unveils each new crisis–from making conversation to deciding what to wear on a date and beyond–in return, he receives advice, encouragement, warnings, and sympathy from the anonymous netizens. And Train Man discovers the secret to what makes the world go round–and proves we really do live in a universe where anything can happen. Note: There used to be an ebook version available, but it has been discontinued. Note: Header image is from a manga adaptation by Machiko Ocha. Thanks for the heads up there; I’ve updated the entry accordingly. It’s a shame that even ebooks can be discontinued though! I hadn’t heard of that being a thing before.